Hollyhock (Alcea rosea 'Apricot-Peach Parfait'). I planted the seeds on my south facing windowsill early April 2010, along with some morning glories and Pride of Gibraltar (Cerinthe major). Later transplanted to containers on my roof garden, the other annuals bloomed last year and died with the frost. 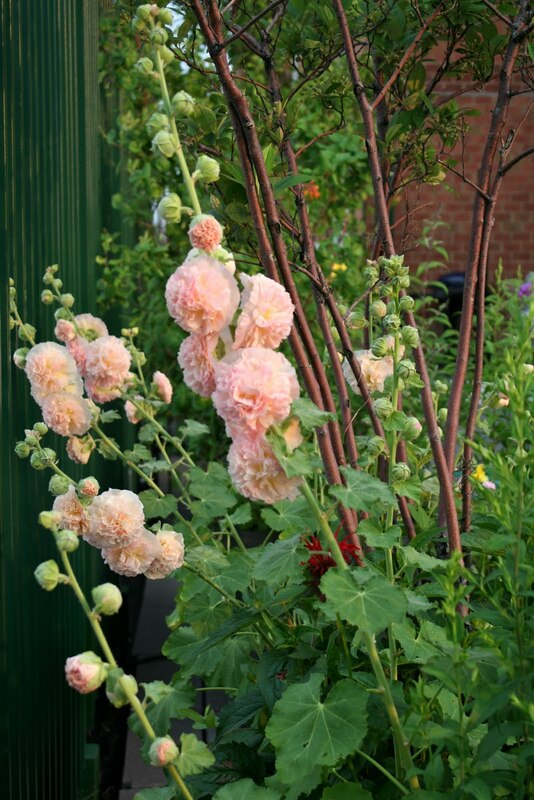 The hollyhock grew big bold leaves but sent up no flower stalks; these are biennials. By spring 2011 the hollyhock leaves had reappeared, and flower stalks soon shot up, bursting into bloom this week. The last time I had hollyhocks, they grew by the doorway of my 1850's peg-and beam-barn. Now They grow in containers overlooking 80th St. with skyscrapers and water towers in the background. It's definitely more of a thrill in New York City, because hollyhocks BELONG by a barn and in New York, I dare say they're unusual. I often get seeds from Renee's Garden Seeds when I want something special, because they have a huge selection of flower, herb and veggie seeds, they're reliable, and the packet contains double the amount of information as most other companies. I'm also seduced by the artwork. Because I'm a writer Renee's usually sends me free seeds, but so do most other seed companies. The online-catalog tells me that if I cut these stalks down near the soil when they finish blooming, the roots will send up new flower spikes in September. You can bet I'm going to do this, then let the last growth go to seed and hope I'm lucky for next year. Note that the wind has blown the stalks on a slant but I prefer not to stake. I like the more natural look. I love the color of your hollyhocks, beautiful! why, but these days there are so many, many chipmunks that I blame them for all vanishing plants. They are furry, four-footed devils. pass it with fingers and toes crossed. I hope it reseeds and returns. 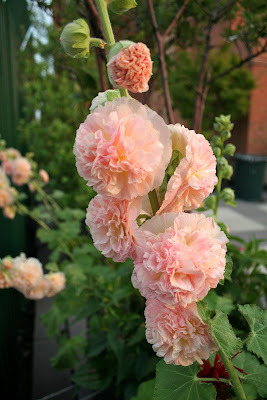 Sarah D. said: Wow, those are some fancy hollyhocks! The few I have (need to grow more from seed) are all singles. Still beautiful, even if not as fancy.